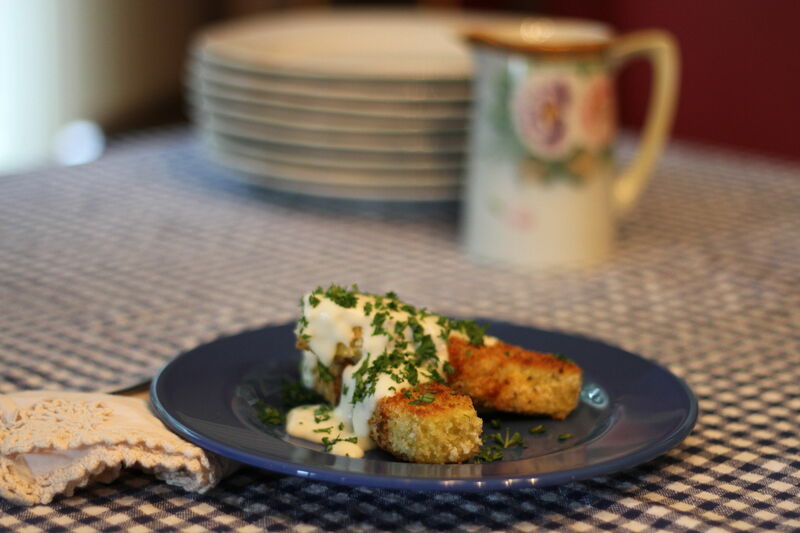 Hey, all you egg lovers out there – here’s a modernized take on a classic recipe adapted from Sarah Tyson Heston Rorer. What? You never heard of her? Well, Sarah was born in Pennsylvania in 1849, and during the course of her life, was a cookbook author, editor, columnist, cooking instructor and public speaker. She is considered America’s first dietitian due to her health-focused recipes and work with medical facilities. During the 1920s, “Rorer” became a household name. Sadly, Sarah lost everything in the Great Depression and relied on friends and family for support in her final days. Sarah was also an egg magician, and I’m aiming to bring her name back to “household” status. In this unusual approach to cooking eggs, Sarah bakes a savory custard until it’s firm enough to slice. The slices are coated in more egg, then in breadcrumbs, and pan-fried to a crisped gold. Top the eggs with some white sauce and perhaps a slice or two of smoky meat, and you’re in for a delightful surprise with this classic, eggy breakfast in bed. Thank you, Sarah! Preheat oven to 350°. For the baked eggs, crack 6 eggs into large bowl and whisk together with stock. Season with salt and pepper to taste. Coat a small, 5-inch square baking dish with cooking spray. Pour egg mixture into baking dish. Place baking dish in a water bath on a strong cookie sheet. Bake for 45 minutes or until toothpick inserted in center comes out clean. This step can be done one day ahead. 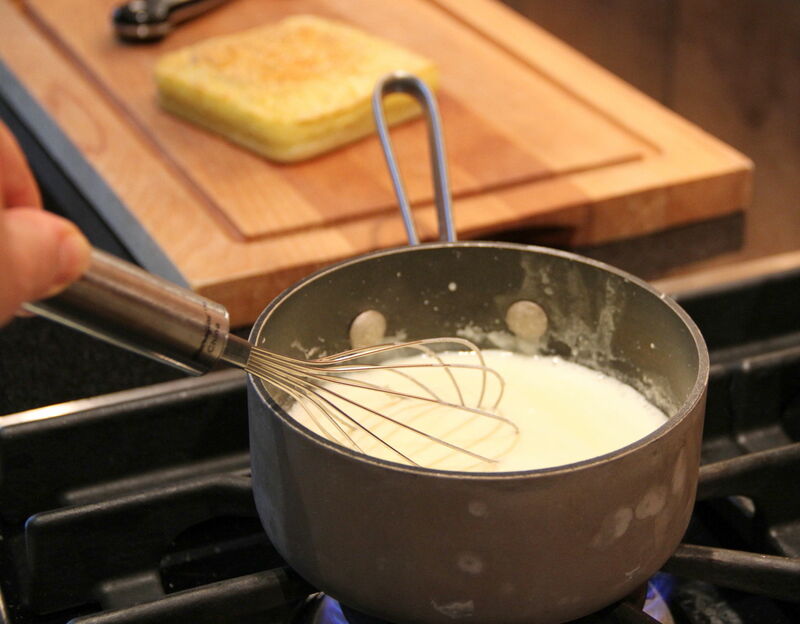 To make white sauce, melt butter in small heavy saucepan over medium heat. Whisk in flour until smooth, thick paste forms. Whisk in milk and cook until slightly thickened, 3 to 4 minutes, stirring constantly. Set aside and keep warm. To bread and fry egg fillets, cut baked egg into 6 equal slices. 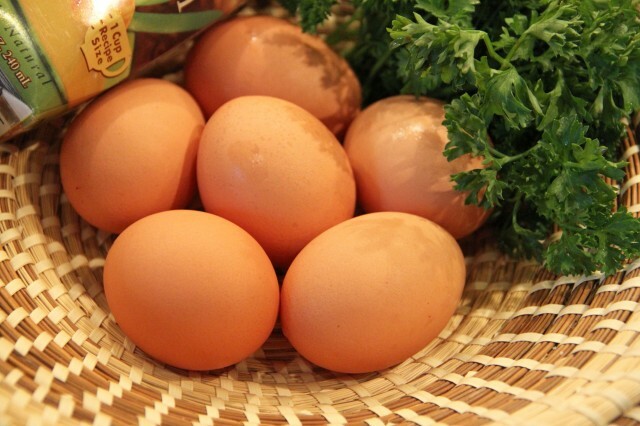 Beat remaining uncooked egg with 1 tablespoon water. Coat cooked egg slices thoroughly with beaten egg, then roll and coat in panko to fully cover. Add 2 tablespoons of olive oil to a heavy pan and heat over medium heat. 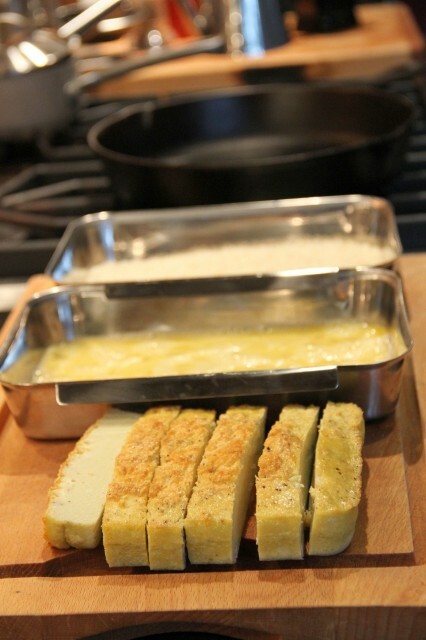 Add egg slices to pan and cook slowly over medium to medium low heat, turning once, until panko is golden brown, about 2 to 3 minutes per side. To assemble, arrange 2 or 3 panko-coated egg slices on a plate. Top with sliced ham or salmon, if using. Drizzle with a couple of tablespoons of white sauce. 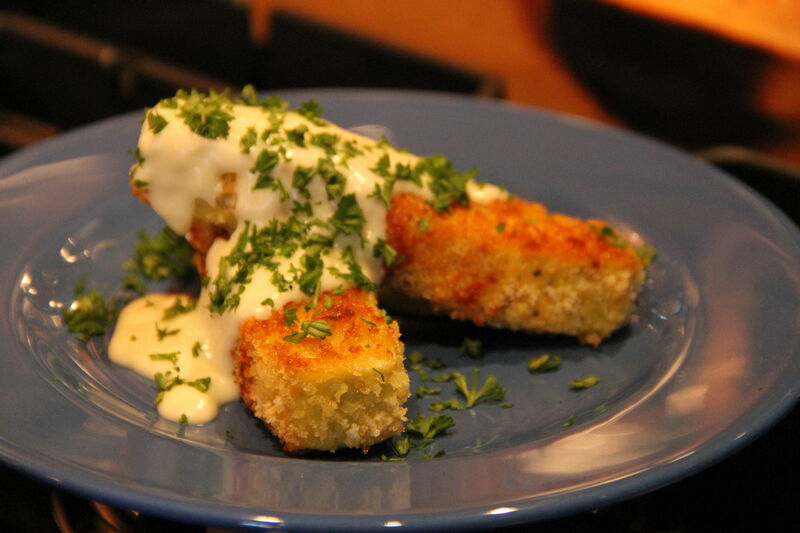 Garnish with fresh, chopped parsley and serve immediately.